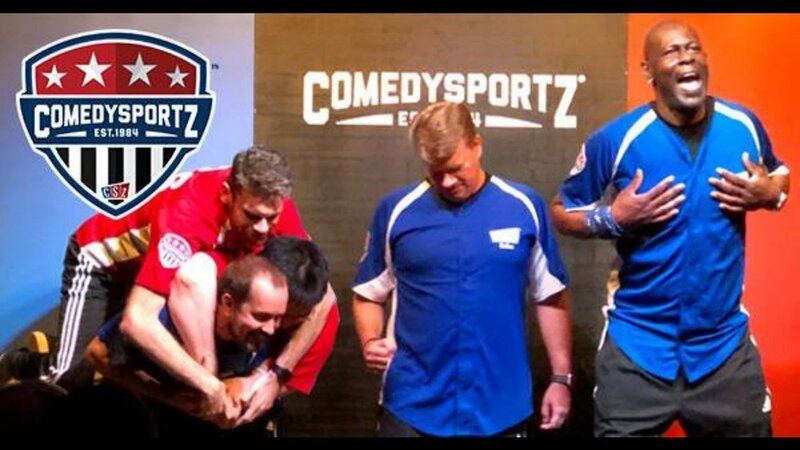 The format for “ComedySportz” is simple, yet incredibly engaging and entertaining. Experienced comedians with quick wits divide into two teams, red and blue, and go toe-to-toe in a knock-down-drag-out, good-spirited, high-energy improv battle. Competitors earn points by swaying the audience to vote for their team by serving up ample portions of hilarity, physical antics and more. It was evident early on in the first “challenge” that these improv gurus came to entertain. They professionally crafted detailed scenes on the spot using a smattering of random audience suggestions and the spontaneity of their teammates as allies. On the blue team, Ethan Gallardo delivered especially uproariously hilarious physical comedy while Danielle King brought a variety of humorous characters to life. In the red corner, Cory Phillips and Claire Billingsley both hit scenes out of the park with physical comedy and sharp characterizations. Team captains Von Daniel (blue) and Jared Berger (red) brought well-timed comedic technique and cohesion to the two teams. Banter between referee, Jessa Berger, and sound engineer, Alex Mai, along with well-selected music and sound effects augmented the fun and sprinkled some spice onto this comedic feast. All told, “ComedySportz” showcases superbly fresh comedic talent and offers a great respite from the intellectually-intense DFW-area performances of late. This dynamic and lively show is a perfect night-about-town for couples or families looking to break out of the routine and enjoy some hearty laughs. The March 23rd, 2019 “ComedySportz” show starred Von Daniel, Danielle King and Ethan Gallardo as members of the “Blue” team and Jared Berger, Claire Billingsley and Cory Phillips as the “Red” team. Jessa Berger hosted the show sound was courtesy of Alex Mai. Reserve your seat for an evening packed with laughs and learn more about the Comedy Arena by checking out www.comedsportzdallas.com or visit them at 305 E. Virginia St. #104, McKinney, Texas. The Comedy Arena’s rotating cast offers shows each Friday and Saturday night with family-friendly performances at 730PM and a mature audiences-focused show at 930 PM.